Developing an allergy during the menopausal years can take many women by surprise. One of the most common allergies that can develop during this time is pet allergies. Fortunately, there are things that women can do in order to cope with newly developed pet allergies, whether they currently have a pet or not. Continue reading to discover the top five ways to overcome pet allergies during menopause. 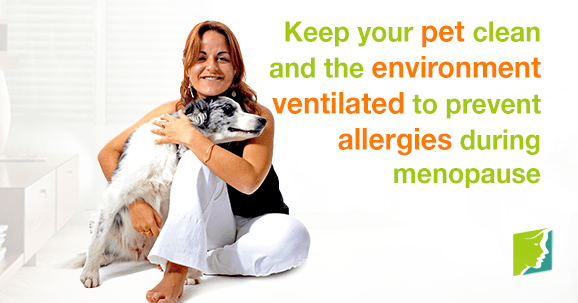 Allowing proper ventilation in your house is key in managing pet allergies during menopause. Try and keep windows open as much as possible. This will allow the air to circulate and help prevent pet hair - and the skin particles attached to them - from settling into furniture and onto carpets, which will exacerbate allergic reactions. Though pet hair is actually not the key cause of pet allergy triggers, choosing a low-shedding pet may reduce symptoms. This is because allergic reactions to pets are actually caused by skin particles and animal saliva. These are more likely to reach you by traveling on pet hair. Therefore, choosing a pet that sheds less will decrease your likelihood of having a negative reaction. Washing your pet's hair regularly can prevent loose skin particles and saliva from clinging to it, and which will reduce the frequency of allergy triggers. Washing your pet's hair regularly is especially important if you already have an animal with long hair. Try and designate space in your home in which your pets are not allowed. This will mean you have somewhere to escape, especially if you feel an allergic reaction beginning. Your pet not being allowed into a certain room will help to prevent any particles which can set off a reaction from gathering there. Just like washing your pet regularly, washing their bedding regularly is important too. Pet's bedding will naturally have a lot of saliva and skin particles clinging to it, and as these can cause your pet allergies to be triggered, frequently washing your pet's bedding is highly recommended. Suddenly developing an allergy during middle age can be troubling and annoying, especially in conjunction with other menopause symptoms. By following the five steps above and making the necessary changes, you can minimize the disruption to your life that pet allergies can make.